Thameside Removals - Removals/Storage based in Henley-on-Thames, Oxfordshire. Thameside Removals understands that each move has its own individual requirements and we can, therefore, offer a custom designed move to suit your needs. All of our staff have been carefully chosen to ensure that they provide the very best efficient removal and relocation. All have extensive experience in household removals. We have a team you can trust. All other furniture will be covered with specially designed removal blankets. Whether you need to store the entire contents of your home or just a few specific items, for short periods or long term, we have the storage solution to suit you. There are many reasons to store your belongings, one of which may be a stop gap during the moving process. In the current moving market, storing your belongings may mean that you are in a better position to move out of your current property or directly into your new property without affecting the moving chain. We can offer both containerised storage or self-storage. We have experience working with dealers for antique fairs, interior designers and home builders (show homes). 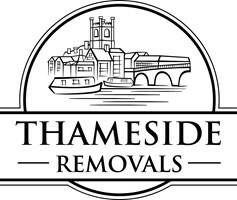 Whether it’s a single item or a complete removal, Thameside Removals will be pleased to help with any enquiry. All staff are fully trained, experienced, polite and courteous. We have excellent local knowledge, having many years working experience in the Thameside surrounding areas. All quotes are individually assessed and can include dismantling and re-assembly of furniture. Based in Henley-on-Thames, covering Oxfordshire, Berkshire and Buckinghamshire.